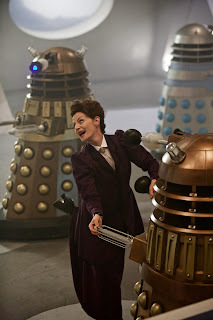 Life, Doctor Who & Combom: Michelle Gomez: "Starting Back on Doctor Who Soon"
Michelle Gomez: "Starting Back on Doctor Who Soon"
"Weirdly, this is the sort of crunch week where I get to find out exactly what I'm going to be doing next. I can officially say that I will be starting back on Doctor Who soon, so that's one thing." Gomez also mentioned a new upcoming project. "There’s a few things, but at the moment they’re all just kind of balls in the air … There’s something else that I’ve created and looks like it’s hopefully going to be out there in production at some point soon." The Music will be releasing the full interview with Michelle Gomez in the coming days.